and to explore new... revisiting moments, revising memories. 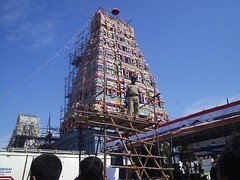 The 45 year long uncompleted Main tower (Rajakopuram) of Chennai Thiruvanmyuir MarutheswararTemple was completed and was went into consecration ceremony today early. 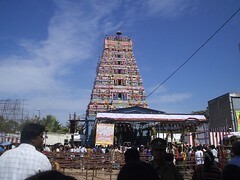 This temple has a history of more than 1,300 years and the inscriptions from the temple said to know some south Indian kings like First Rajeanthiran, Rajathee Rajan, Rajeanthira Shozath Theavan First Shozan where been taken to many services and to construct and maintain the temple in 11th century. Marutheswarar Temple was been get to singed by saints of Niyanasambanthar, Thirunavukkarasar and the Sage Valmiki who wrote The Ramayana get salvation from the divine in this temple so it get the name Thiruvanmiyur after a long period of time which was called as Thiruvalmikiyur. And in honoring him there was a street near to temple named Valmiki Nagar and a temple for him stands alone in centre of the ECR. For Forty Five year it has been left unsighted by people with just column of seven standing and I to see mendicants stay there the most. It was the wish by people have exists today with the current govt.’s fund to renovate the structure in a crore. Today my parent's went to watch consecration ceremony and got me the pictures; and to know there is 9 days varies ceremonies to be held. 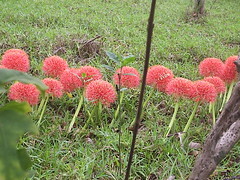 These flowers bloom ones a year on the month of May, so called May Flowers. 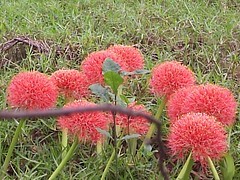 In scientific it was known as African Blood Lily. These pictures were taken last year inside Adyar Theosophical Society, grown these flowers beneath the old Banyan tree which adds attraction. It’s set to be traveling back to the prehistory where the mammoth hunters exist. The bravo’s people crawls under the gigantic mammoths foot and chase them to kill for meat. D’Leh, the young hunter defeat a mammoth as a very single to killing with the sharp weapon and get holds his childhood sweet heart Evolet with blue eyes. Before the beautiful hearts to swing their wings a bunch of mysterious people come on horse and grab the tribes pulling across mountains, forest and deserts. D’Leh looking from hidden follows with 2 of hunter tribes seeking their kidnapped brothers and sisters walking through the freezing snow mountains, facing with strange creatures in forest and miles crossing deserts with the helping African tribes whose people where also been grabbed by the horse-riders. After reaching and sighting with a large pyramid like structure been made with thousand of kidnapped people and how they win the encounter leads. But it remains like mummies; still I could not feel that something seen from prehistoric and the story what I expect in 10,000 BC is no more there and the thing comes to mind is rescuing the bonded labors. 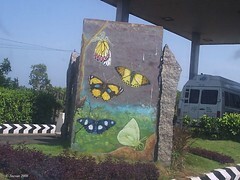 A wall of butterflies... near a tollgate. Sparrow is a commonly seen small bird everywhere, looking in brown-gray colors and with a tiny beak. It feels beautiful watching them and the grains they pierce to eat with their beak. I could view them back from my balcony they sitting here and there on the passing cable wires, opposite trees in some home garden; in morning and evenings they sonance to fly, come and sit on the balcony wall to eat the bits of rice kept from home. It’s nearly two three years I rarely see this bird, but these days they are hardly visible in cities particularly in Chennai. I think the single most houses are turning apartments these days and the green trees are lost for human comfort and construction which make lose these Sparrows. Those are pleasant days, but today in the name of sparrow what is released is totally conflict. Yesterday went to watch the Sparrow spending some money, even though warned by some it is flying high don’t try to catch, but I did and fell down. If you don’t get the point, Sparrow is the title of a Tamil film naming Kuruvi staring Vijay and Trisha. 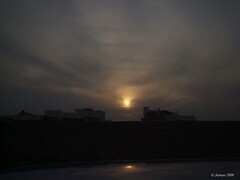 After the day long heavy sunshine, the clouds formed in evening turns the atmosphere pleasure even it was thermal, but surly doubtless it won’t pore where we ahead is drive-in theater. About the film: It is said to be a fast-track entertainment, but what I felt is senseless ventilation. The story and screenplay is mainly developed to show Vijay’s heroism and for a commercial purpose, so every thing is magic making people foolish and nothing seems logic. The action sequences are throughout eyewash, some are remaining Krish and through the beginning car race is just like watching video games and the climax scenes recalls Telugu films. The music is Vidhyasar? One could really get a record dance effect and in fast-braking dance by Vijay. Trisha comes as usual like a cute doll in cool sleeveless and skirts and tries to do some comedy, is funny. Vivek’s comedy is boring like the taste comes after eating more cake. Appearance of Malavika for few minutes in the car race scene would cheer cheerleaders where the sport is only different. Vijay did a bravo acting in actions and tries to show a superman statue to his fans and what he did is extraordinary to accept and he should realize that people are not fools to clap and whistle whatever he do. Director Dharani can’t overcome his older films and this is nothing to do with my favorite Gilly under his banner which wants me to look. And to see the plus thing is the camera, which bends and turns to whatever the director tries to capture. In V.T. Vijayan’s editing and Gopinath’s camera visualizes clearly strikes and the skies, islands and some places of Malaysia and New Zealand sights good. The film covers allover some early subjects and adds to give a new feel, buts fails to fly freshly. 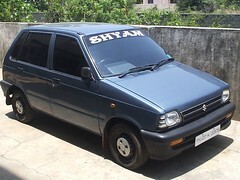 The latest version in Maruti 800 is something attentive to my views recently, esp. the front design is seems I like it. I wish it would be nice having that model and really I got that thing right now in the car we use. The car is an old model one and too bad it recently get into a small accident to which had a hard kick crashing front fully and left at uncle’s workshop. For weeks uncle been telling it is getting ready with a new look in a different color. 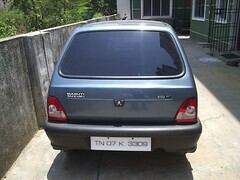 Today it was been exposing like a latest version, only looking inside will disappoint showing the real face of the car, which was cover by newly parts and everything is early inside except the new DVD system and LCD movie monitor. I could tell it simple rocks first time to be on the ride on weekend, going to beach and on ECR keeping volume high exciting to throw traveling on like a new car, but originally a old one. Weekend I watched this wonderful film, which is really beautifully. 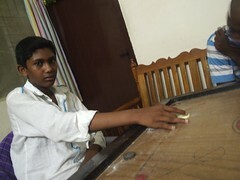 I and cousins were enjoying from the beginning till end. 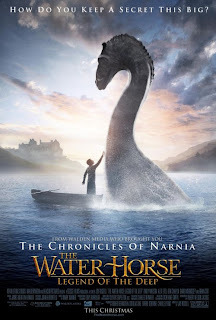 The Water Horse comes from an egg found by Angus (little hero) from the shore under water. Secretly he grows the strange creature inside his home in store room keeping away from his mom and to help Angus comes Lewis a secretly appointed person to watch Angus‘s hidden thing by her mom. After going through the friendly relation between Angus and Crusoe (The Water Horse), Lewis agreed to help Angus for his strange friend to keep with him. In a change Crusoe grown into large overnight, that sent them to leave it into the lake. That time the Army arrives for exercise yet to happen on the banks of lake where that becomes a caution and obstacle for Crusoe’s life. Angus really disturbed by this process and he tries to save Crusoe which ends in peaceful as well beautiful. What I liked more in The Water Horse is the pleasant scenic space that tales fairyland. The Scottish lake is an unexplained beauty with serene Blue Mountains, clouds here and there, the stoned shore… the very thing is nothing gives the violence feel and the horse with dinosaurs large hangs for friendly swing with the boy is peaceful. Whatever the small Crusoe does is fun and lovable; the scene inside the bath tub and dog chasing is a god pieces. This film is just not only for the fantasy loving children, for all age people this gives a love to heart the case what this Crusoe is indifferent. It’s an imaginative film which gives a realism feel. Any more to tell the boy acted as Angus is cute and his eyes speak is affection. The music is mild and the moment moves with the cameras extraordinary picturesque. When to seek for the minus thing about the film, is none comes to mind where everything covers beautiful. if not I am dwell loss. like more than a shadow when I shine. quite her thoughts about me. and distress to suffering for her son. My Very Happy Mother Day Wishes to all. Barath tagged me to write whatever comes to mind in 9 minutes of absolute Freedom. I have more than 9 minutes of freedom, so let me put something comes often to mind or I think about. (i) Who did take away the freedom from me? In wisdom I know the reason, but sometimes in impossibility I seek justice just like a fool. (ii) What am I doing here, to live on my heart wishes or to compare myself with what others are? Though I am not lying for anything and to hide what interest me. Uncomfortably I feel not taking anything series to mind, just living the moment freely and one thing I never want to lose is my conscience. (iii) Most of the time reading filled my life, and what I am learning through fill me with knowledge. Just only concentrating on good things reading will not allow knowing another side which would be not good. We must know what is not good around us, so then could think how to clear them with good knowledge. (iv) Being happy about what was enjoyed before that can’t be experienced now. I wonder as climate change the characters and values of people would also be changing? Something what spreads later colorfully is not collected today to spread beautifully. The joy is missing and to mind it can’t accept the inconvenience resist by unknown reason which is left without anybody to seeking. (v) What gives us food is found lying without shelters prevent beating from heavy sunshine. The higher education helps to intermediate, but none seems like interested in what makes us live today and tomorrow. Thinking about infrastructure there is no doubt in it, well it need; as well none should forget our depth that holds our breath. When we know for constructing a building the strength of the foundation is important, but when comes to life how much we need that support. Many educated expect the occupation in the only field they learned and what earns them more. I am not to accuse any, but I see no literate is ready to pay there attention on the fields of agriculture. The knowledge is to know everything, but never said to lose the depth of life and what is important. (vi) Love is no more than anthing sharing with others. Many a time the world resists talking with strangers, even though those faces are not strange. I think to how it would be nice if people shares the moment just for bring a human being. There is no use to born and die, in between gape we needs people and love to last till our last breath. I don’t know whether to conflict or leave to the love of someone I have on if I only lose generally which is more for the few minutes of memories? Just for self satisfaction and to be true to my love I leave them to see they are happy. 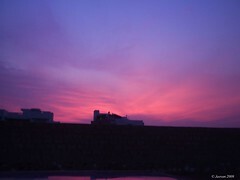 Much time I really hurt that my love is not understood and unfinished. Ulaga Nayaganea... the first thing about this song is the catchy lyrics of Vairamuthu in praising Kamal Hassan and the attractive beats. ‘Come dance with me before u go,’ the dawn gives something fantastical feel through mind and the enjoyable in flow of rhyme lyrics. One needs a good music system to enjoy the quality. It was an excellent song for a dance sequence and in Vinith’s energetic voice it well rocks. Kallai Mattum Kandal... The Oooooommmmm namo narayana.... welcomes with Hariharan's deep breathtaking vocal. The line "Kallai Mattu Kandal Kadavul Thariyathu, Kadavul mattum kandal kalladi thariyathu," I see it tell like, if you see only idol there u can’t see divine and if you see only divine you can’t feel the pelt. One thing is it has something strong behind as listening so it gives a feel the bravery. It is a song describing some struggle happening as historical event back in empires period with devotional touch. Sure a grand picturesque must be in video? Oh...Ho...Sanam... A song will poll honey in your ears, a song will poll tears in your eyes, and let body goes to earth and music rules the earth. It begins like this, and the simply beautiful lines continues about song and universe. Kamal himself singed in his own style the best in his voice ever? I feel so, but the tune only remains some song without a clue. It is a happy stage performance song and nice instrument sounds. Mukundha Mukundha... is my favorite one in the album. How I like this song much really wonders me and to checkout it was singed by Sadhana Sargam. I adore her voice for the feel of soothing always and in this song she singed very beautiful. The music is scored in traditional way and to imaginative Asin is perfect for this song and seems like she describes Krishna, and kamal in filling her mind. To finishing with a very old women sings few lines makes this specific in Kamal’s vocal?!! Good. Kaa Karuppanukkum... White Vellaiyairukkum... it’s a hot number singed by pop Shalini Singh. The music drives away too fast to catch what she really sings, but if you slowly follow the lines those are chilled. 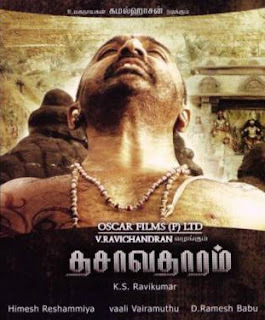 The lyrics are very young written by Vairamuthu and few lines are very sweet and fun. The last few lines goes like September 11thandru twin tower sainthathu en tower saivathillai; Iravathu vayathukkul aruvathu string’avungal honey…. Cool! Oh... Ho...Sanam... it’s a remix of the same song in voice of Himesh Reshammiya and Mahalakshi Iyer with more modern style and it was nice where no English is mixed. Not bad, but neat finishing.